This page has a very simple purpose - to enable you to find Andrey Tarkovsky's grave, if you wish to do so in person, or to leave a comment as a memorial if you cannot get to the municipal cemetery in Sainte Genevieve Des Bois, about 33km from the centre of Paris, where Tarkovsky is buried. 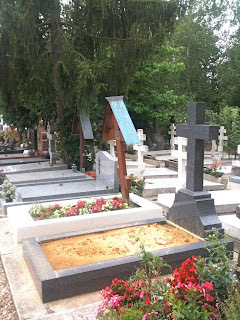 I visited this cemetery in August 2010 and, as it was a Sunday afternoon and there was nobody to ask, I spent a very long time wandering around trying to find one grave among many thousands! There was no locating detail on findagrave.com. The photos of the grave posted on Flickr barely had enough information to identify where in the cemetery the grave would be found. 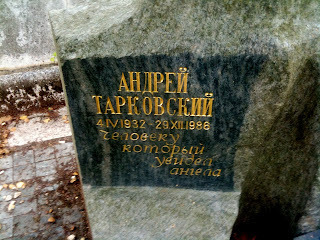 It also occurred to me that there might be admirers of Tarkovsky and his work who would like to find the grave but will find it all the more difficult if they cannot read Cyrillic. So I thought I would create a simple site to assist with the task. 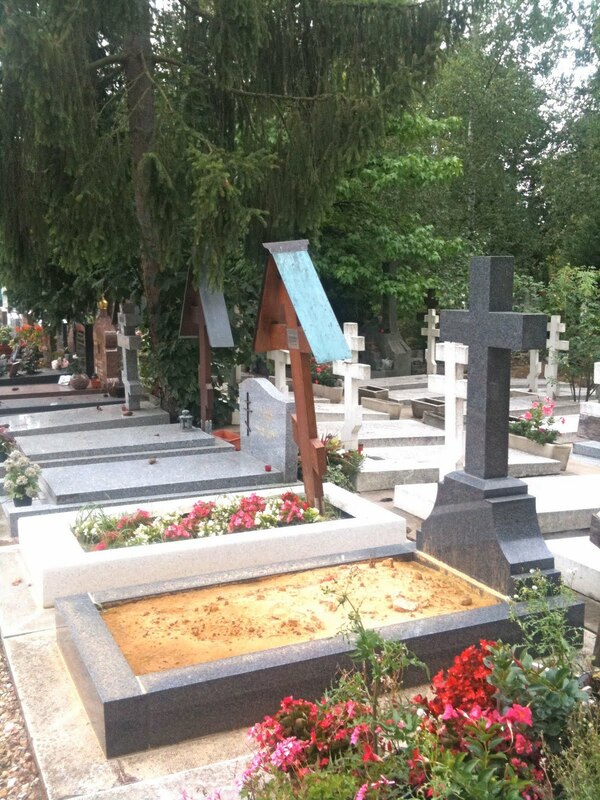 To get to the cemetery, you can take RER line C to Sainte Genevieve des Bois, and from the station catch bus 104. This does not go down Rue Leo Legrange, on which the cemetery is situated, but turns off just before it. From the centre of Paris the combined RER, bus journey and walk will take 50-60 minutes before you are at the cemetery gates. There is a large plan of the cemetery just inside the second gate. 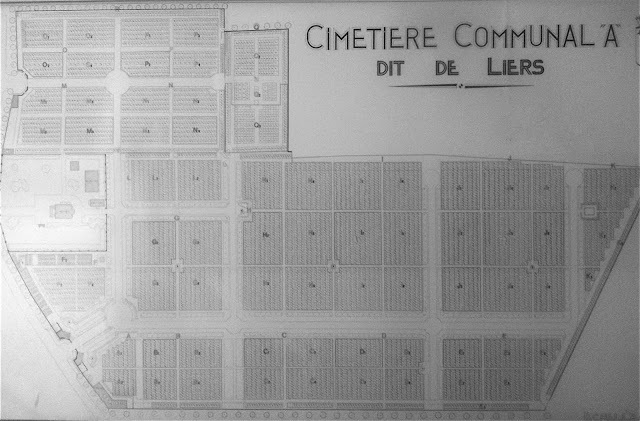 If your eyesight is very good (looking at the plan in real life, not at this tiny photo! ), you will be able to see that in zone J1 there is a grave 7259. 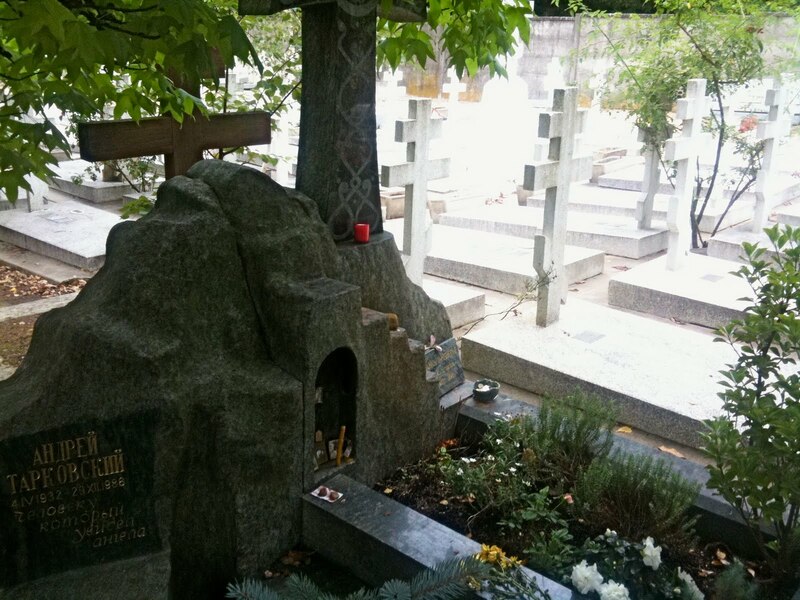 I am reasonably certain that this is the plot number for Tarkovsky's grave; if it is not, and you head for that plot number you will certainly find yourself close enough to find it from the photos posted here. The plot is near one of the surrounding walls and if you walk along the path running beside that wall, you will get this view towards the row where it is situated. It is under the mass of greenery in the middle. The grave itself looks like this. On the left hand side is a small tablet commemorating Tarkovsky. 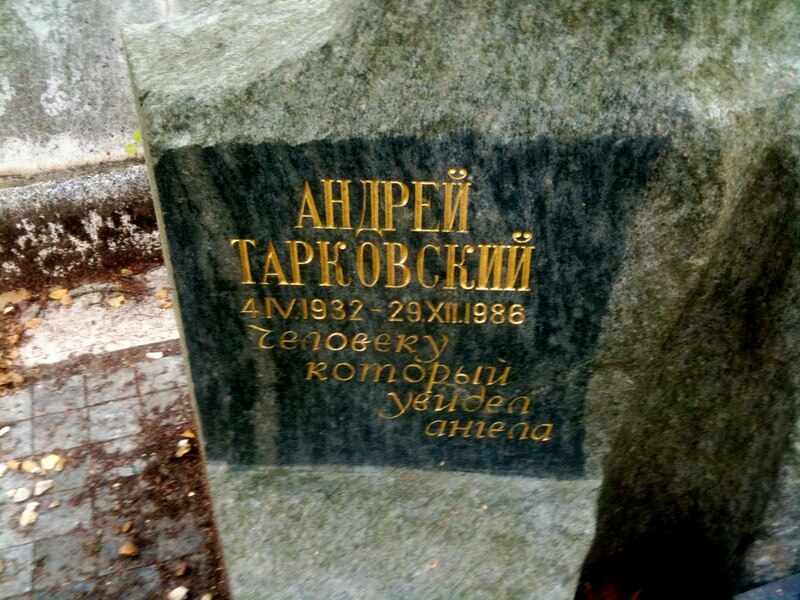 The inscription on his grave stone, which was created by the Russian sculptor Ernst Neizvestny, reads: Andrey Tarkovsky - 4.IV.1932-29.12.1986 - To the man who saw the Angel. As when I arrived at the RER station the bus 104 was already waiting, so I had no time to buy some flowers in the centre of the suburb. By the side of the grave, seeing a very small number of tributes already there, I regretted this. 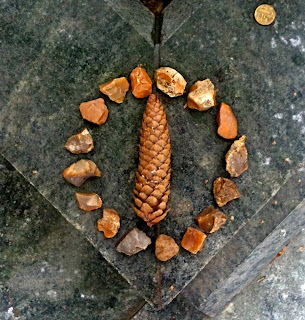 I decided to create my own "found wreath" out of pebbles and natural objects readily available around the grave. I should like to think this was an acceptable tribute, given Tarkovsky's love of nature and natural forms. So that is my account of how to find the grave. If you are an admirer of Tarkovsky's work, and you are unable to go to the grave yourself, why not leave a comment below about what his work means to you, as a tribute?